STILLWATER, Okla. – Kaitlin Butts has been going non-stop these last few years since bursting onto the scene, and things definitely don’t seem to be slowing down for her any time soon. She’s been traveling all over Texas and Oklahoma lately with her band, which seems to change names depending on the night. Sometimes she calls them the Burnouts, sometimes they are her Contraband and occasionally among lots of giggles and snickers she calls them things she wouldn't want her momma reading. Sitting down with the whole band over cheese fries and other amazing food before their show at Eskimo Joes a couple weeks ago made for a very entertaining interview, you can tell she travels in close proximity with all guys and their questionable humor for long periods of time. Then again, she fits right in there with them. Currently the band is made up of Caleb Shirtum on bass, Matt Hargis on guitar, Tyler Paul on drums and Johnny Shadid on pedal steel. They have a new live music video out for Butts’ song “Gal Like Me”, that was produced by Night Hawk Productions. Butts and the band went out to a little farmhouse in Ardmore and shot the video live, and actually the shot that they ended up using for the video was the first one they took. They mentioned that this might be because as the day wore on they got more sweaty and disheveled, as well as maybe a little bit drunk in the process. Butts always has a quick and witty sense of humor which keeps people highly entertained. The music video series isn’t the only thing new going on for the sassy red head either. 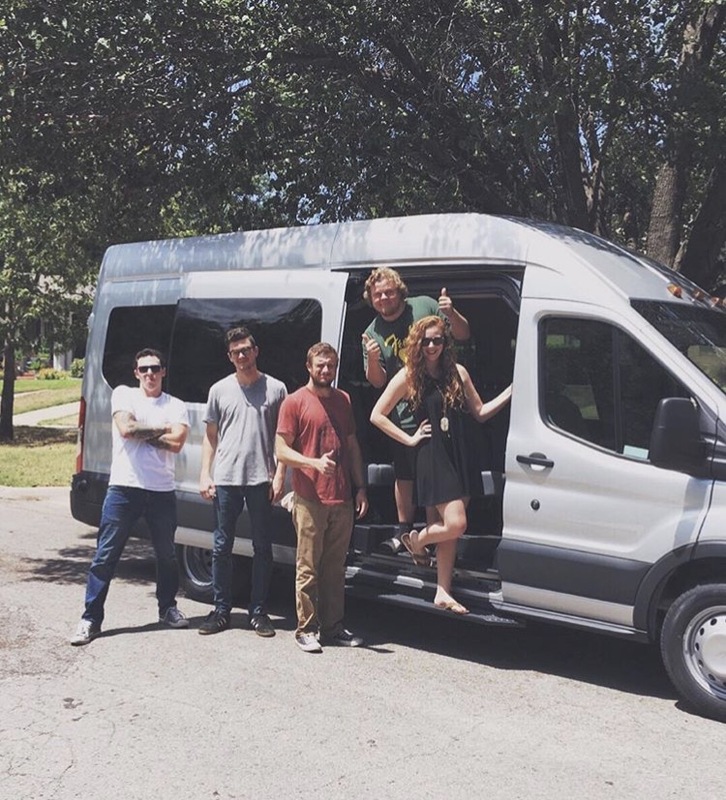 Butts just bought a new passenger van for the band to travel around in, and she recently sold her house in OKC and is in the process of getting her new home fixed up and ready to live in, in Ardmore with her mom. Which in essence puts her as homeless as she bounces around staying at place to place until her home is move-in ready. If you follow her on Snapchat you can watch Butts and her family doing the repairs and construction work, her grandma is especially entertaining to watch in Butts’ snaps. Probably the most talked about new thing going on in Butts life these days though is her relatively new boyfriend, Cleto Cordero, singer of the Texas band Flatland Calvary. They are the picture perfect All-American couple in all of their ridiculously sweet pictures that they post on social media. Both are adorable and equally impressive in their fashion choices. They might just be one of the best dressed couples around, not to mention a music powerhouse couple in the Texas/Red Dirt scene. “People are always like “Can we talk about your relationship?” When they interview me and I pretty much don't stop shutting up about it so I don’t really care. I mean we sing together on a song, it wouldn’t make sense if we were just random people dating. I think that since we have that song together, it just makes sense to talk about it,” she said. In fact Butts singing on the Flatland Calvary’s album is how they met in the first place. Cordero didn’t originally write the song “A Life Where We Work Out” as a duet, but after a friend of his encouraged him to change it to a duet, he began searching for a voice he thought would be perfect for it. He happened to hear that song playing on the radio while traveling through Forth Worth with the band late one night. Cordero was the only one awake and “Gal Like Me” came on the radio, and he found out who it was and reached out to Butts through a mutual friend and fellow Texas musician Dalton Domino. It didn’t take her long to agree to come and sing on the album, which she did immediately after returning from a vacation on a cruise. The smile on Butts face while talking about Cordero and their relationship is cheek to cheek, and there’s definitely a sparkle in her eye about it all as well. She’s been able to travel quite a bit with Flatland Calvary in the past few months, they seem to play the same shows quite a bit, or close enough they can come to each other’s shows when they have a night off. The duet they sing together is featured on Flatland Calvary’s new album Humble Folks. Butts has several big shows and festivals coming up including JAB Fest in Lubbock and Ranch Bash in Fort Worth- both in October, and Medicine Stone in Tahlequah later this month, which she was very excited to be added to the bill late when an empty spot had to be filled. This also puts Butts as a second female on the bill, along with Jamie Lin Wilson, after a public outcry that the festival wasn’t supporting female musicians in the scene. “Evan Felker called me and told me that The Damn Quails weren't playing and they needed to fill that spot and they offered it to me. I never would have thought that I would have Evan Felker call me personally and be like ‘Hey do you want to play Medicine Stone?’. I told Cleto, I was like ‘Guess who is calling me? Guess who's on my caller ID?’ and he was like ‘Shut up! You have to go’,” she said with a laugh. That’s not the only really cool festival she’s been invited to join lately. Butts has also been asked to join the Red Dirt Pub Crawl with Cordero in Ireland in December, which they are both thrilled about. The event takes place over 7 nights all around Ireland and features Shane Smith and the Saints, Rich O’Toole, Bleu Edmonson, Thom Sheperd, Elaine Kay, Clayton Landau and Coley McCabe as well. Early bird tickets have already gone on sale with discounts available. “I’ve got the new house, new van, new relationship, it’s definitely a transitional phase, but once I get into this house and set up I’ll have my own space to really just sit down and focus on my music and writing. Right now I'm just shuffling and just trying to seem as organized as possible, well kind of organized, I try,” said Butts. Closing out the interview she asked her band what their theme of the day was as their ending quotes. “Stay off of mushrooms,” said Shirtum. “Watch out for the Winking Brown Eyes, they are coming for you,” said Hargis. “Hi mom, I love you,” said Butts. Be sure you check out her website at Kaitlinbutts.com, as well as her various social media sites to keep up with this busy gal.